Are you searching for the perfect area rugs to place in your living or dining room? The right rug can make a dramatic difference in any room’s appearance or comfort; that’s why choosing can be a bit challenging. When you are looking for the most suitable rug for any room or space, you can be sure to get exactly what you want with our made-to-order rugs. The design specialists at our store partner with you to find the look that perfectly suits your aesthetic preference. We create custom area rugs for clients seeking more personalized options. Stop by today to explore your customization options, and let us know how we can help you obtain the custom-made rugs for your unique décor. There are many reasons to opt for custom rugs, especially if you want a particular size, style, color, or shape that is not available among standard choices. 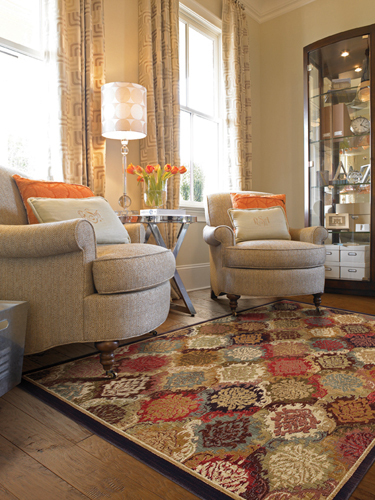 You can have the exact color, pattern, and material you imagine when you work with our designers for your new rugs. With our help you can have a stylish and newly bound area rug to suit any area or space in your home. We offer numerous choices of binding styles and colors. Complete your décor ideas when you bring them to our team to produce the look and feel that is right for you. With made-to-order rugs from our area rug specialists, it’s easy to create the atmosphere you’ve always wanted in any room in your home. No matter which room you’re looking to cover, you’re sure to be happier with custom area rugs created by our team. From bedrooms and living rooms to dining rooms and sunrooms, it’s easy to bring together any room with rug made to complement it. We take pride in offering a large selection of customization options, so don’t hesitate to mention your preferences for size, shape, color, and pile. If you’re unsure what type of rug is right for your home, or for a specific room, simply consult our flooring experts. We’ve helped many clients create their custom-made rugs; now, we’re ready to use our experience and our resources to assist you in creating a rug you’ll enjoy for many years to come. Let us help you evaluate any room’s atmosphere, and then use it to create the perfect floor covering. Contact our team to start creating your own custom area rugs. We proudly serve shoppers in Bedford, Manchester, Hooksett, Concord, and Hollis, New Hampshire.